Affiliation: The Institute for Solid State Physics, University of Tokyo, Japan. In our recent work , the evolution of electrical conductance was investigated from tunneling to atomic point contact whose atomic geometry was precisely defined using scanning tunneling microscopy (STM). We found that the conductance evolution depends on the contact site; for instance, on-top, bridge, or hollow ('hexagonal close packed, hcp' and 'face centered cubic, fcc') site in the close-packed lattice of the substrate, indicating the importance of the atomic configuration in the conductance of the atomic junctions. 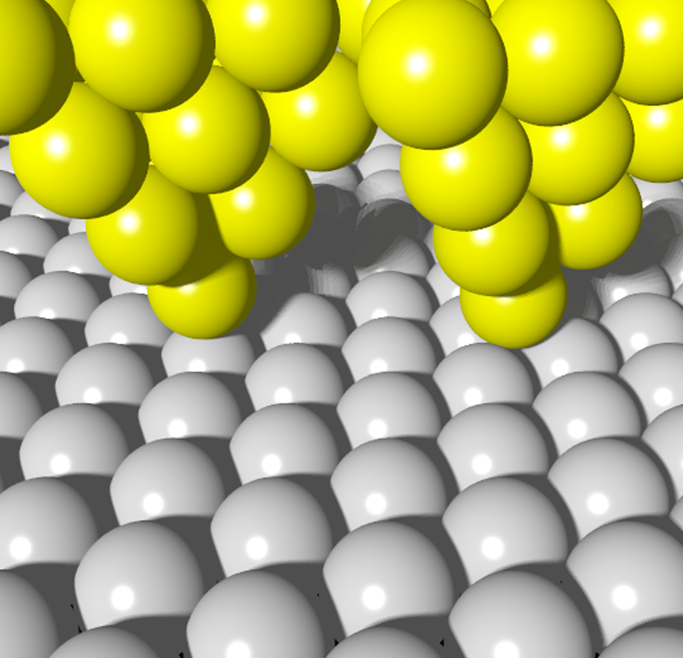 Electronic conduction through atomic-sized metal contacts is of fundamental interest as a transport mechanism though the ultimately squeezed conductor . Several seminal phenomena, such as quantization and step-wise variation [3, 4] in the conductance, have been reported using a method called break junction in which the conductance is measured just before the breaking moment of a nanometer-width thin wire. Since atomic geometry of the point contact cannot be controlled and the measured conductance fluctuates at every breaking, therefore, the obtained conductances are usually analyzed in a statistical manner. 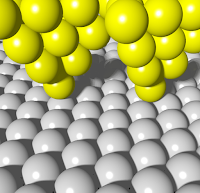 Scanning tunneling microscopy (STM) has also been utilized for the study of atomic point contacts, in which the contact is formed by pushing the probe tip toward the sample surface. Because of plastic deformation of the tip by the contact formation, however, quantitatively reliable and reproducible measurements have been difficult. Figure 1. schematic showing the atomic geometry of the atomic point contacts formed at an on-top site (left) and a 3-fold hollow site (right) of a close-packed surface. Here, in our study, making most of the capability of the atomically resolved imaging of STM, we measured the conductance of the atomic point contact in an atomically controlled manner. We first positioned the probe tip on a specific site, for instance, on-top, bridge, or hollow (fcc and hcp) site, in the crystallographic lattice of the substrate surface (Fig. 1), and then measured the conductance while moving the tip toward the substrate from tunneling to contact regimes. It is found that the conductance evolution depends significantly on the contact site. When the contact is formed, the hollow site has the largest conductance, and among the two hollow sites the hcp site is more conductive than fcc. When the tip is pulled from the contact by just 20-30 pm, a crossover occurs and the conductance at on-top site becomes the largest. Figure 2: electrical conductance measured from tunneling (Δz = -20 pm) to contact (Δz = -60 pm) regimes. The measured conductance G is normalized by the quantum conductance G0 given by 2e2/h (~77.5 μS). For each conductance trace, 10 traces taken at the corresponding sites marked in the atomically-resolved STM image (inset) are averaged. The traces of the electrical conductance measured from tunneling to contact at on-top, bridge, fcc, and hcp sites of the Pb(111) surface are shown in Fig. 2. For each plot, 10 traces obtained from the corresponding marked sites in the inset STM image are averaged. At the tip displacement Δz of -50 ~ -60 pm from the tunneling (Δz = 0), the atomic contact is formed as the conductance shows saturation around the quantum conductance G0 given by 2e2/h (~77.5 μS). The contact conductance shows strong site dependence; the conductance at the hcp site is largest and more than 50 % larger than the one measured at the on-top site. Around Δz = -30 ~ -40 pm, that is, when the tip is located above the substrate by 20 ~ 30 pm from the contact, the plot indicates the largest conductance at on-top site. Figure 3. Spatial mappings of the conductance at various tip displacements (upper left) topographic STM image (3.0 X 3.0 nm2) taken simultaneously with 64 X 64 conductance traces. (lower left) conductance mapping at Δz = -32pm, where the largest conductance at on-top site is enhanced (Lower right) conductance mapping at Δz = -60 pm, that is, the contact regime, where hollow site, particularly hcp site, has large conductance. (upper right) schematics explaining the site dependence of the conductance. The atoms on which the chemical interaction is exerted are marked red. In order to spatially demonstrate the site dependence, we performed real-space mappings of the conductance in the on-top enhancement region and in the contact regime. The upper-left panel of Fig. 3 is an STM image showing the atomic contrast taken simultaneously with the conductance traces. At a tip displacement Δz of -32pm, the conductance mapping (lower-left of Fig. 3) exhibits bright contrast at the on-top site, similarly to that in the topographic image. As the conductance mapping at Δz = 0 does not have any contrast, the bright contrast indicates the conductance enhancement at the on-top site. On the other hand, the conductance mapping in the contact regime (lower right of Fig. 3, Δz = -60pm) has its contrast reversed from that of the topographic one, indicating a larger conductance at the hollow site than at the on-top site. 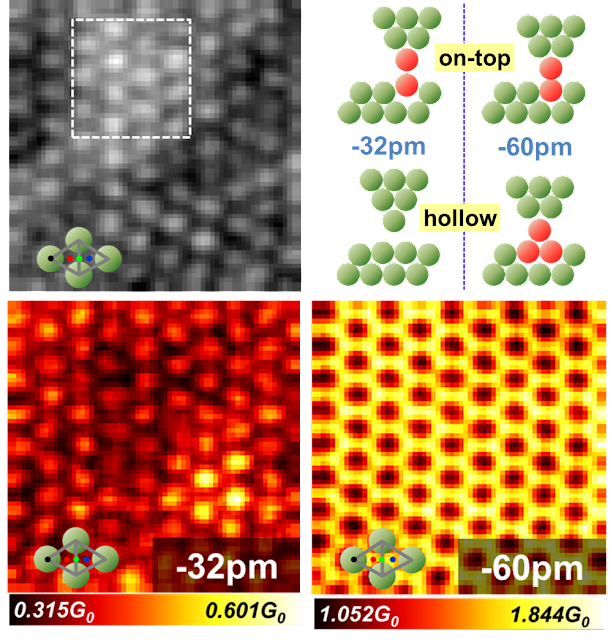 These results clearly demonstrate that the point contact conductance is quite sensitive to the atomic configuration. When the distance between the tip and substrate is reduced, the attractive chemical interaction is exerted between the surface and tip apex atoms. This interaction presumably opens up the conduction channel and contributes to the development of the conductance. Schematics in the upper right panel of Fig. 3 show how the chemical interaction works in the case of contacts formed at on-top and hollow sites. When the tip approaches from the tunneling regime, the attractive interaction is exerted first at the on-top site (the force-exerted atoms are marked red in the schematics) because the substrate atoms are closer at on-top site than at hollow sites, thus making the on-top conductance enhanced. 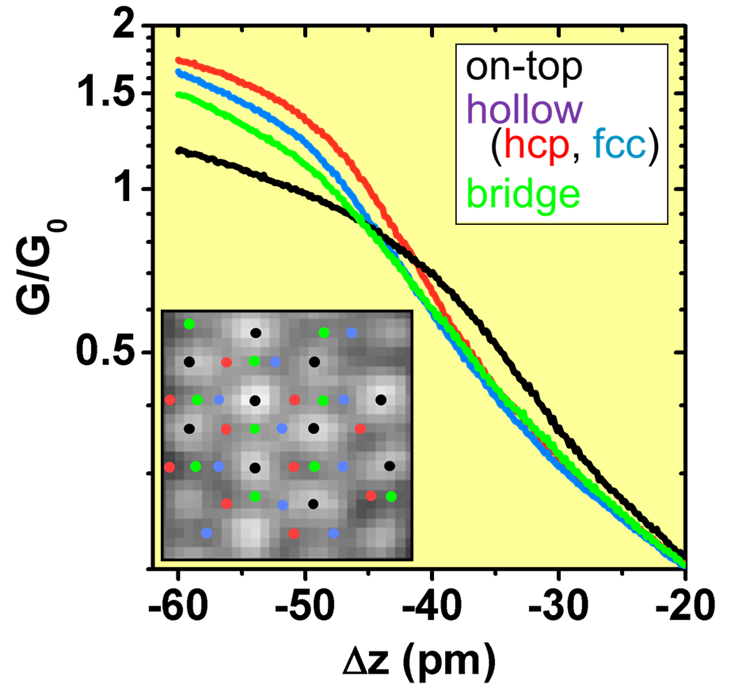 In the contact regime, however, the attractive force becomes stronger at hollow sites because of the greater number of involved atoms than the on-top site. This is probably the reason why conductance becomes larger there at the contact. Obviously, theoretical studies , simultaneous measurements of force and conductance by atomic force microscopy , and/or conduction channel analysis of the atomic point contact  are needed to elucidate the observed conductance behaviors. 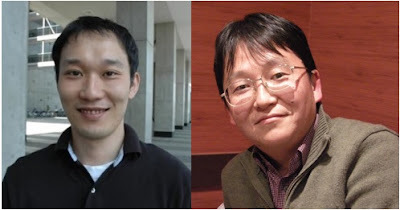 Howon Kim and Yukio Hasegawa, "Site-dependent evolution of electrical conductance from tunneling to atomic point contact", Physical Review Letters, 114, 206801 (2015). Abstract. Nicolás Agraı̈t, Alfredo Levy Yeyati, Jan M. van Ruitenbeek, "Quantum properties of atomic-sized conductors", Physics Reports, 377, 81 (2003). Abstract. J. M. Krans, J. M. van Ruitenbeek, V. V. Fisun, I. K. Yanson, L. J. de Jongh; "The signature of conductance quantization in metallic point contacts", Nature, 375, 767 (1995). Abstract. L. Olesen, E. Lægsgaard, I. Stensgaard, F. Besenbacher, J. Schiøtz, P. Stoltze, K. W. Jacobsen, J. K. Nørskov; "Quantized conductance in an atom-sized point contact", Physical Review Letters, 72, 2251 (1994). Abstract. Jose Manuel Blanco, Cesar González, Pavel Jelínek, José Ortega, Fernando Flores, Rubén Pérez, "First-principles simulations of STM images: From tunneling to the contact regime", Physical Review B, 70, 085405 (2004). Abstract. Yoshiaki Sugimoto, Keiichi Ueda, Masayuki Abe, Seizo Morita "Three-dimensional scanning force/tunneling spectroscopy at room temperature", Journal of Physics : Condensed Matter, 24, 084008 (2012). Abstract. Howon Kim and Yukio Hasegawa, "Site-dependent conduction channel transmission in atomic-scale superconducting junctions", arXiv:1506.05528 [cond-mat.mes-hall].